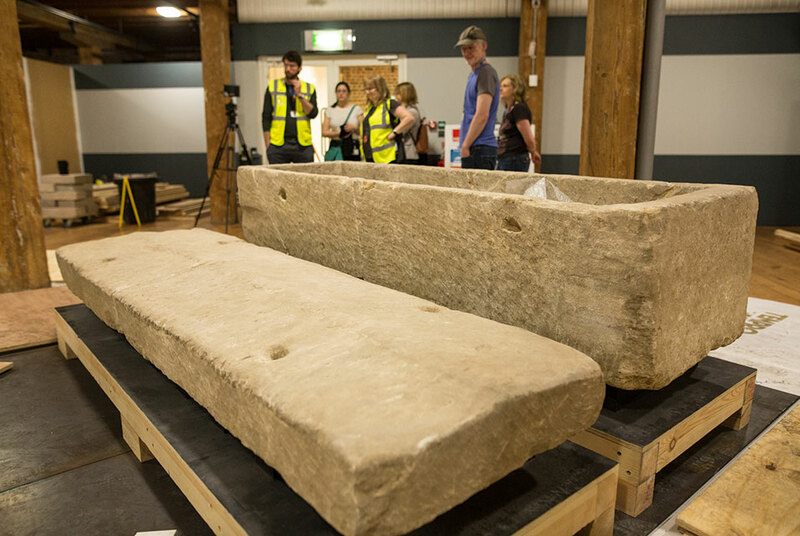 The Roman sarcophagus unearthed last year at Harper Road in Southwark, central London, has gone on display at the Museum of London Docklands. It is part of a new exhibition dedicated to how Romans in ancient Londinium dealt with their dead. The sarcophagus will keep company with the remains, inhumed and cremated, of 28 Roman-era Londoners discovered in ancient cemeteries and more than 200 grave goods. 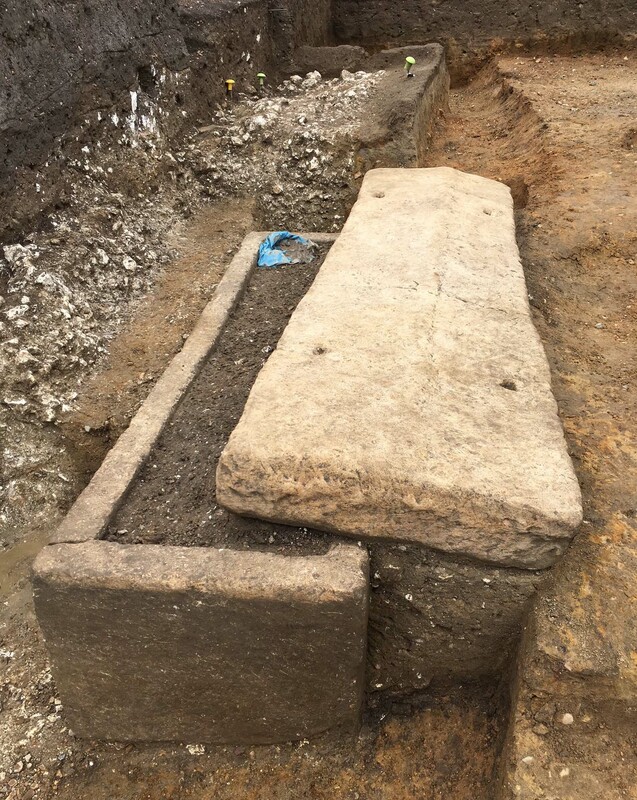 Only two other Roman sarcophagi have been found in situ in London, so this discovery gave researchers a rare opportunity to study a high end Roman burial in its context. The lid was pushed off to the side and the sarcophagus was filled with soil. 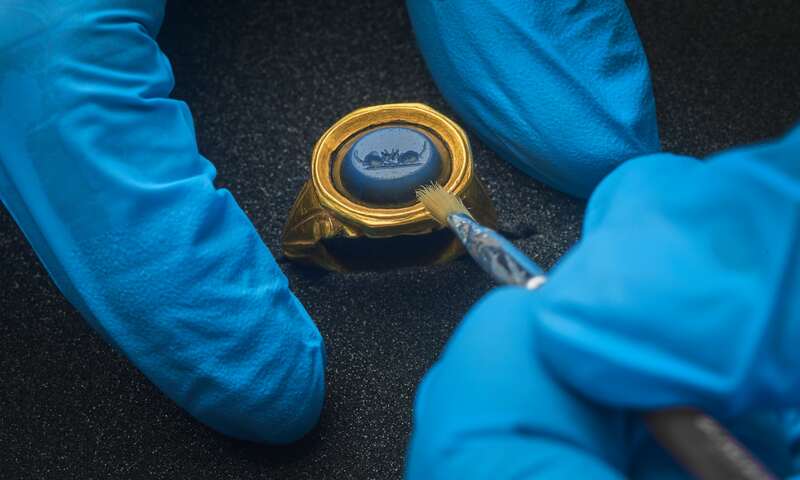 Archaeologists believe it was looted in the 17th century, likely after it was discovered accidentally during construction work. The bones were crudely pushed over to one side of the coffin and one of her arms was thrown out of the coffin, perhaps to strip it of jewelry. Filled with heavy clay, the sarcophagus weighed a ton and a half. It was carefully raised and moved to the Museum of London to be excavated in laboratory conditions. Archaeologists knew its valuables had been removed by the tomb robbers, but metal detectors did register the presence of something metallic. That proved to be a single flake of gold, thought to be part of an earring, and a jasper cameo that the robbers had missed. 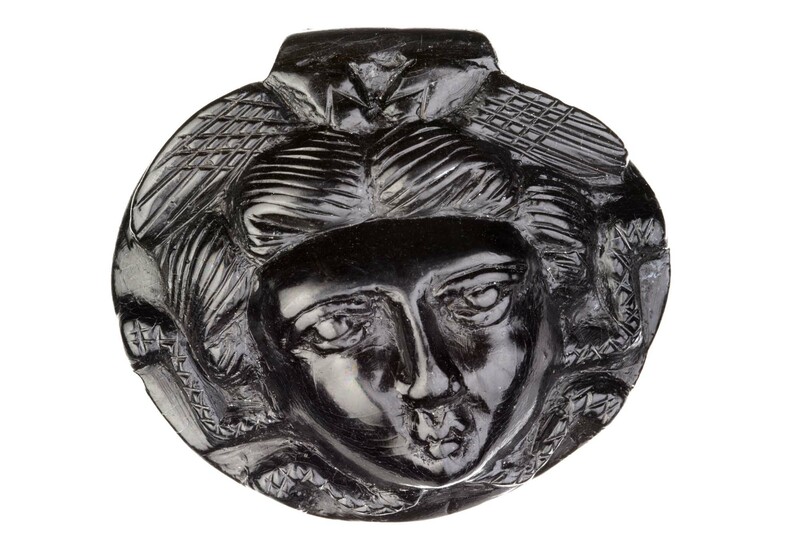 Some spectacular funerary artifacts will be showcased in the exhibition, including a Roman face pot used as a cinerary urn, a jet pendant carved with the face of Medusa and a gold ring with an engraved gemstone depicting two mice eating together, likely the country mouse and city mouse from Horace’s Satires. 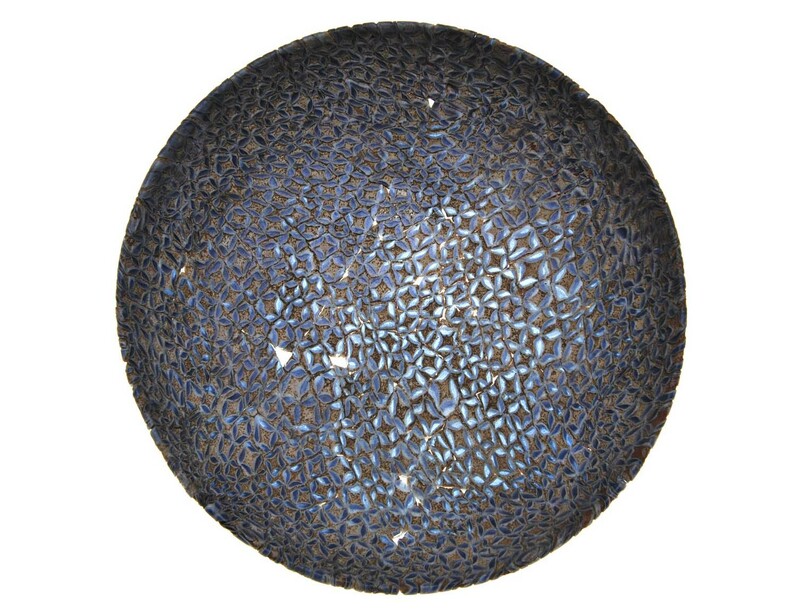 The most valuable in monetary terms may be a millefiori glass dish that was found with cremated remains in Roman London’s eastern cemetery in 2009. The remains had been interred in a wooden container with the dish. 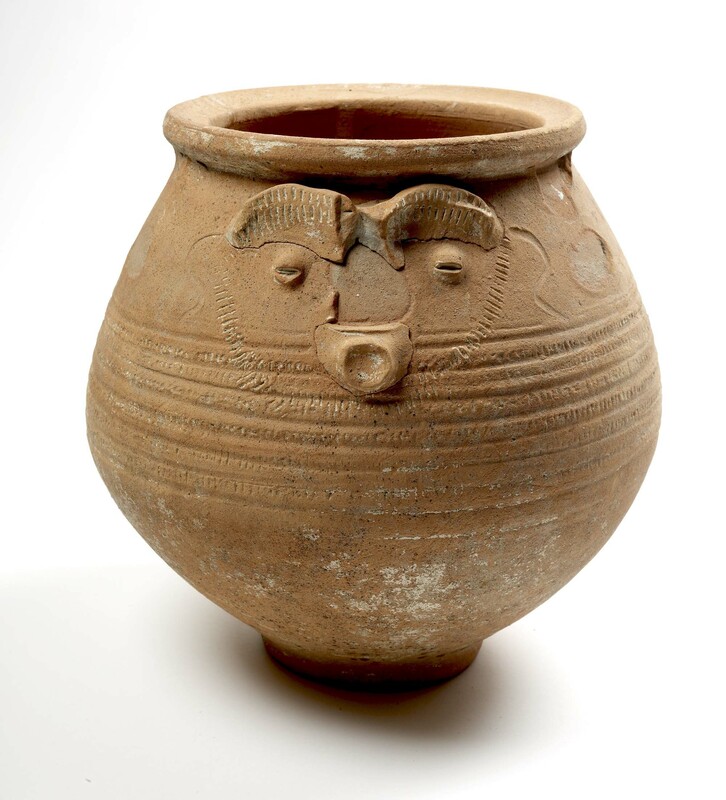 It’s in exceptional condition and a very rare object in Roman London or the western Empire as a whole. It would have cost many times a soldier’s yearly salary when it was new. There are a number of events scheduled in connection with the exhibition. This weekend a workshop will be held exploring the historical context of the Southwark sarcophagus and giving guests the opportunity to make their own mini sarcophagus. It won’t be carved out of stone, though, so harumph. The Close to the Bone workshop held this June, on the hand, sets my nerdy little heart to pounding. Immerse yourself in this hands-on workshop where you will learn different ways and techniques of identifying biological profiles of individual skeletons, as well as exploring unique details inside the Roman Dead exhibition with our exhibition trail. Explore 2D and 3D facial reconstruction techniques with the guidance and knowledge of professionals from Sherlock Bone. You’ll also learn all about the work, processes and ethics behind the Museum of London’s Centre of Human Bioarchaeology, which was established in 2003 to curate and research the human remains excavated in the City and the Greater London area. With over 20,000 pieces of human remains in the museum’s collection, our Curator of Human Osteology, Dr. Rebecca Redfern, will share studies and insights resulting from this unique and captivating collection with you. The Roman Dead exhibition runs from May 25th through October 28th. There is a minimum age — visitors must be at least eight years old — and admission is free.